How do you define what is virtuous and what is not? If an act brings you closer to the truth, it is a virtuous action in buddhism. Okay. If an act – okay, so if an act of whatever, for instance, if, let’s say in order to save like these two, let’s say this two are being chased by a murderer. In order to save these two, the murderer asks me: “Have you seen these two?” I say: “No.” That is a blatant lie. That is an act of lying. But I am saving them. Such kind of act, outwardly it is an non-virtuous , but actually it is bring you closer to the truth. To the compassion, love, and all that. So therefore, especially in Mahayana Buddhism, action that brings you closer to the truth is virtuous. Action that does not bring you closer, action that brings you further from the truth, even though it may be seemingly virtuous such as going to Bodhgaya and do hundred thousand prostration and making sure anybody is looking at you so that you become famous, whether anybody is taking photograph of you, you know. To self-cherish and all of that. This is bringing you further from the truth. That is non-virtuous. Every religion has an enemy, looks like. Like Christians and Muslims they have like Satan and so on and so forth, right. Every religion. And buddhism also has one. The devil of buddhism. And what is that? It is called distraction. Constant distraction, that is the satan of buddhism. So, understandably, the main, quintessence of the buddhist practice is obviously mindfulness. This is where mindfulness is taught in the theravada tradition, in the mahayana tradition, in the vajrayana tradition, mindfulness is the thing. Buddhism deals with the truth. Truth is something that generally people are not that interested. Buddhism talks about things like impermanence. Illusion. Not many people are interested in those things. In buddhism and specially in mahayana buddhism – well not only mahayana actually, buddhism we talk about metta, karuna. But this kind of love taught in buddhism is what we call limitless love. Some of you who are familiar with the buddhist concept of four limitless thoughts you will know. In fact love is the first thing out of four limitless practice we are introduced. And the definition of the love is wishing all sentient beings to be happy and not only to be happy but to have the sense of gathering the cause of happiness. And such kind of love is aimed at all sentient beings. Therefore the object is limitless. Such kind of love has no personal agenda. So from the intention point of view it is limitless. Such kind of love is not aimed at acquiring happiness in the sense of you know mundane happiness. But this kind of love is really aimed at true happiness which is enlightenment or in other words to awaken from net of delusion. So it is limitless, it is not limited as how we – the ordinary concept of love. Something you should really notice about Buddhism. Buddhism is a path that is designed to erode itself. Buddhism is a path that is designed to cancel each other out. I found an example here. Like a soap. You know what is soap supposed to do? Soap is supposed to clean your dirt. But if the soap, your soap that you are cleaning with, if that is not reducing, going slimmer and slimmer, that means that you are not really washing. That means that it is sitting in the cardboard somewhere, isn’t it. So both the dirt and the soap has to go. If you a running out of the soap then that means that you have been rubbing a lot. If you have been rubbing a lot, that means a lot of dirt must have gone. Buddhism, the path, yes it is designed to get rid of defilements. But it is not something to be kept. You cannot expect to bring this beloved Buddhism as a souvenir when you are enlightened. Ultimately Buddhism is not designed to be a successful manager. In fact, ultimately Buddhism is to really ruin your career of management. If management and leadership is so important, Siddhartha would have never left Kapilavastu. Because he had the greatest opportunity to manage the whole country. Buddhism recently has gained some good ratings in the media, looks like. Buddhism is always associated with non violence. Buddhism is kind of associated with happiness. If you have a title happiness on your book and something to do with the Buddhism it is almost guaranteed to be a best seller. So Buddhism, non violence, happiness, a kind of becoming a synonymous. While this is of course as a Buddhist, this is kind of good thing, it feels good, when you are associated with something good, especially in this kind of time where religious fanaticism is so strong. At the moment, we Buddhist are kind of going through the honeymoon period of enjoying this reputation. But this worries me because Buddhism is not to, the purpose of Buddhism is not to make you happy. And this is very important for us to understand. The ultimate purpose of Buddhism is to go beyond happiness. To achieve enlightenment, that is the most important. Because happiness is very relative. Watching a world wrestling federation twenty four hours can be a happiness for some people. So practicing Buddhism purely for happiness therefore is not really the ultimate aim. 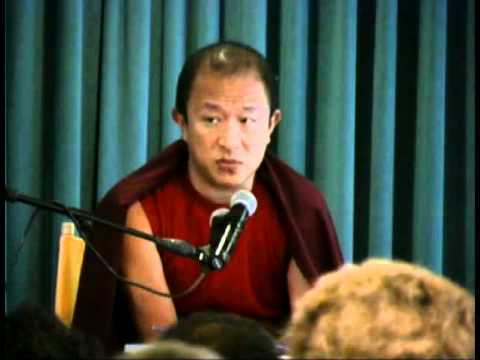 Student: Rinpoche you mentioned that there is a lot of interest in mindfulness in the west. And particularly there is lot of excitement about our so called science of happiness. And electrodes on our head, people measuring whether meditation objectively works. And I was wondering what you thought about that because a lot of Buddhist friends seem to get very excited about it. But it makes me feel slightly uncomfortable. And I was wondering what you thought about it, because if it is really furthering the Dharma, the true Dharma or if it is sort of worldly. I see. Well I am kind of, I am very arrogant about this. I tell you. 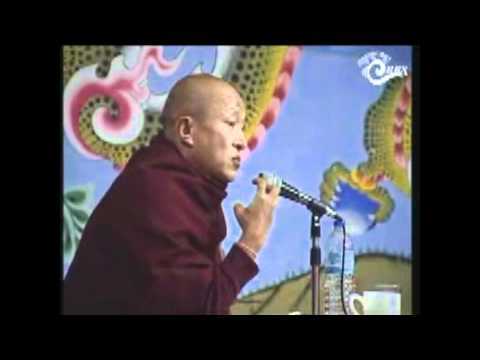 You know Patrul Rinpoche, one of great master, he said: If you go to a barbaric land and if you need to teach this barbarics Dharma, then you have to act like one, speak like one. He said that. I have that kind of attitude. If modern people put so much emphasize on science, and if they think science is the only valid truth, and not only that, since they are already trapped with that logic, that way of thinking, on top of all our normal habitual patterns this is right, even though there is not a single reason why this is not a left. Or if we have decided to, if the modern people have decided to fall into that trap, then in order to talk to the modern people, yes I think this meditation with what, you said, all the scientific experiments, why not. But only to communicate because – I don’t know I haven’t met all the, I mean I don’t know, I meet so many different kind of scientist, seems to, but generally there is only one phenomena that will know the mind, and that is the mind itself. Nothing will know. All the other gadgets are toys, all the other systems are just another way of talking. And that is fine, that is fine. If that is the way to talk, why not. It is always like that, you know like cats have only two vowels I think, right? Cats. They can talk. They can talk wonderfully. We have how many vowels? And we are still not able to talk as much as we are really like to talk. And if the science needs to be bring into this situation, ya why not and we should also adapt. But if scientist or whoever, these people who are doing these experiments, if they could buy into what the Buddhist call non-duality, which is non other than the compassion, then actually it doesn’t even have to be referred as the Buddhism. I am not so attached to that label. But some – actually I have been talking with some people recently, very recently. But the dialog between the modern thinking and Buddhism, anything to do with the dualism and non-dualism seems to be so difficult. It is just so difficult. And of course, understandable it is difficult. Because non-dualism is not something, is not – we can only proof that dualism is futile or, I don’t know. England, I think UK generally and I think really fortunately – I am just realizing this more and more – fortunately England actually has much more affinity and they seem to be at home with the Theravada tradition, which is fantastic actually, really good. Every time I meet non Tibetans who become Buddhist but they happen to be sort of ex Theravadan, ex Mahayana practitioner, but they later became a Vajrayana, tantric practitioner, they are always the best ones. It is always these people and ya but Vajrayana students, tantric students who happen to be an ex follower of some Californian guru, very strange I tell you, very strange. It is very worrying, for themselves it’s worrying, for Buddhism it’s worrying. Buddhism is like a, Buddhism has always been and should always be, it should be, must be actually, it has to be a corrosive path. It has to rust itself. It has to cancel itself. Path must cancel itself. When the path is canceling itself, then this Buddhist path is good. But that’s difficult. Because many times the paths are very intricate and the workmanship is so good. So it is a very fine product. It is like just, like really, the workmanship, the finishing, the quality is so good. And the temptation to keep it as a souvenir, temptation to belong to and wear it and show off to others, so strong. But that is our challenge. If you are listening from the classic Buddhist teachings, one truth is that all, everything that is made, everything that is gathered, everything that is put together, everything that is produced which basically is everything that we have, they are all impermanent. Nothing, there is nothing that is permanent. Before the Buddha, it was impermanent, while he was teaching it was impermanent. It is not because Buddha said all compounded things are impermanent somehow everything became impermanent. It is going to be impermanent looks like. Until a scientist or some technician manages to produce one produced good as a permanent thing the Buddhist refuge of I take refuge to the Dharma is not going to change. If one day scientist or engineer manage to produce something that will not fall apart yes then Buddhism is collapsed. Then I take refuge to the Dharma is completely collapsed. Then we should really go and have lot of fun actually. Otherwise, but until then, this is the truth. All compounded things are impermanent. All produced, made, put together, composed, created, fabricated, made are all impermanent. This is one truth that we take refuge. And that’s why we call it, we say I take refuge to the Dharma. When we say I take refuge to the Dharma we are not taking refuge to a book. Book is produced. It is going to fall apart. It is already falling apart. The truth is what we are taking refuge, this impermanence. There are many different methods of discipline in Buddhism. Myriad in fact. One method, or the morality or discipline that is prescribed in one particular teaching almost contradicts with another morality or method or discipline in other Buddha’s teachings. For instance, you know this is actually why ordinary people not knowing the ultimate aspect or nonduality there is so many misunderstandings. For instance like if you go to traditional Buddhist societies or countries like Thailand or Sri Lanka. There the monks would eat meat. It is not because they are allowed to eat meat but they are supposed to eat whatever is given or offered on that day. But then again if you go to places like Japan or China, the Mahayana practitioners, for them the discipline is no meat at all. So there is already some kind of a contradiction within the Buddhist discipline. There is so many of that. What is allowed to one person is not allowed for others. And then for Tantrayana practitioners, many people seem to have misconception that tantric people are allowed to doing lots of things that are not allowed to others which is not true. There is never an allowance, there is never – to be more precise, there is no, it’s like methods or the disciplines such as shaving hair in Buddhism for the monks is purely a skillful means. So in other words what I am saying is again, nonduality have to take the precedence, or nonduality is more important than shaving hair or not shaving. It is to understand the nonduality, it is to actualize the nonduality the discipline such as like monks vow or nuns precept vows are applied. Purely to understand the nonduality. See if, again, if we loose the nonduality and if Buddhism really puts an importance to the morality then it will become very dangerous. Because then a value of a practitioner will be judged by who is morally good and right. And this is very dangerous because many times we know that morally somebody could be – of course we are using a very big language, morality. Somebody could be very good with the morality but they may have no compassion, they may have no understanding of the truth. And because there is no understanding of the truth, and because of that there is no compassion. The morality actually becomes a pillar for our pride and arrogance. So the whole purpose of morality is again defeated. First of all I like tell you, there is a difference – of course you know this – there is a difference between Buddhism and Buddhist. Buddhism is what? All compounded things are impermanent. Everything is inherently non existent. So on and so forth. Pure. Incorruptible. Simple. Right? Now Buddhist, well, you are looking at one at the moment. Corruptible, contrivable. Yes, why? Because beings like myself, Buddhist, we are just a human being. You understand? I think this is quite an important question. Because this kind of question has been raised in many different occasions, intentionally or unintentionally. I even experienced this, at one day there was a – you know, I saw a person who became a monk. He shaved his hair, under the Bodhi Tree actually. And next day, he was fighting with a rickshaw driver, right outside – not fist fighting, but arguing really violently almost. And then next to me there is a Westerner who said: “Isn’t he a Buddhist? How comes he is not controlling his emotions?” People have this kind of expectation that the moment you change, the moment you take refuge, you will change everything. If we could, how nice it would be. But that is not possible. I think it is really important to know that primarily to study Buddhism actually means to study science of oneself. This is really important to know. It is not a study of some ancient text which happens to be some kind of a survival kid that is written for a specific mountain dweller or a desert dweller. You know we were talking about how important it is to study Buddhism, specially today. Buddha Shakyamuni said, that everything is matter of conditioning. And I believe education is one of the most crucial conditioning. It is the education that will make the difference in the future. And I believe that if today’s education system does have even a scant of Buddhist influence it will make a big difference in the world. Imagine a member of a senate in the United States government, someone who has, maybe not really a practicing Buddhist but someone who has quite a good knowledge on interdependent reality. Someone who has quite a good understanding on cause, conditions and consequences. I think there will be some difference. Imagine a CEO of an American automobile association. Having little bit of influence of the Buddhist education. I think it will make a big difference. Some of you maybe quite new with Buddhism. For those who are new I really admire because it is kind of a honeymoon period, it is really inspiring. Buddhism for many of us, those who loves wisdom, those who loves intellectual approach to the spiritual matters. It is wonderful. Buddhism is very logical, rational. At the same time it has a sort of endless depth. Therefore to be inspired by the Buddha, his teachings and the example of his followers is amazing. It is really really wonderful. But those who are jaded like myself, those who have been Buddhist for many many years or those who have been born as a Buddhist, jaded Buddhist I call them. Callus is it? Under our feet, there is a part of flesh that has become almost insensitive. You know like no feeling, the callus Buddhist. Jaded Buddhist. These Buddhist like myself, we really need to think seriously about the motivation. Motivation really makes a big difference. Because as I stressed yesterday, for many of us in the beginning we come to the Buddhist path because we think Buddhism is going to fix your problematic life. That is not the right motivation. That is a very ?theistic motivation. Many people do this. Christian do this. I am sure Muslim do this. Actually you don’t need Buddhism. If you need to just fix the problems in your life you don’t need Buddhism. Actually to tell the truth Buddhism is not the best solution to fix your problem in your life. Buddhism I dare say it actually adds more problem. Because you hear all this information like impermanence. Right? That doesn’t help. It is very sad. Things like egolessness. All this doesn’t really help. Many of us, we come to Buddhist path because we think that Buddhism – I don’t blame you actually. The blame must, if there is any blame it must go to the teachers. Specially the Tibetan teachers I think. The Tibetan teachers they portray Buddhism as some kind of a shamanistic, ritualistic sort of – okay you have this problem, this is the remedy. Do this puja, do that puja. Do this, do that. And if it is coming from the right view, right act, right meditation, right explanation. Wonderful. The tantric methods are powerful, enlightening, and compassionate. Amazing. But if it is coming for purely a motivation to solve a temporal problem it is dangerous. It’s misleading. And it is because of this many of you guys, you end up trying to learn Tibetan culture instead of learning Buddhism. If you are a Tibetologist, by all means go ahead. That is what you are here for. But if you want enlightenment you don’t need Tibetan education. You don’t need the Tibetan culture as the ultimate necessity. Of course, whatever is given by the master, that is necessary. I am telling you this because I am questioning the motivation of many of us including myself. Until today as a Buddhist I can proudly say to the world that in the name of the Buddha, Dharma and Sangha we have not yet massacred a lot of people, caused bloodshed, invade other countries, convert them by force. We haven’t done that yet. And I strongly emphasize the word yet. Because it can happen. I think there is a tendency that it can happen. Because you know why? Because most of the Buddhist we are so much in love with the cultural aspect of Buddhism, not the Buddhadharma itself. A very important question to be asked I believe. This might shock you, shock many of you. I think Buddhism, the whole Dharma practice, is a placebo. You know placebo? Placebo. Placebo is a pill, it is a fake, it is not a medicine. Sometimes you give it to someone saying that this will work. And they eat and they think it works. Whole Buddhism is that. And Buddha said so. It is not that as if I am making it up actually. Buddha said that. The path, it’s a deception but it’s a necessary deception. It is a necessary deception. Let’s say you and I are in the dessert. You are very thirsty. Everywhere you look you see mirage and you think it is a water. And you say you really want to go to this water. Now I have been to the desert and I know you are hallucinating. Now I can be very unskilled, little bit of compassion but no skillful means, no wisdom. And then I can tell you: “Hey you shut up, this is not a water, this is a mirage.” That is not going to help you. So if I am a compassionate, skillful, then I might say: Yes. Even so knowing that this is not true. Because I know that you will not hear me saying this is not water. I will have to say: “Yeah, let’s go.” I might even go with you. And as we get closer you yourself will see it is a fake. And this is what we call skillful means of the Buddha. There is a thousands of that. How many? Eighty four thousands placebos. Once actually Bernardo Bertolucci, this was, I remember this, he asked me about tantric Buddhism. And he said: “Well you know I am an Italian. For me passion is very very important. Passion. Tell me something about Buddhism and passion.” Then I was saying: Well, maybe, I can not say so much. But according to the tantric Buddhism you can keep your passion but you can’t have your self. If you don’t have you, then your passion becomes really abandoned. Very rich, very sort of not bound. Right now our passion is very limited. And you can see the way we try to turn on ourself so to speak. We are running out of our ideas now as you can see. Everything we tried and it is becoming so boring.